magete's review (This content has been automatically translated from French)" AWESOME PRACTICE"
A PREAMPLI LAMP !! AWESOME FOR WHAT I DONE !! I RECORDED FOR THE FIRST TIME IN GERMANY ON MOTU IN GREATER STUD IT ME TOO AND FROM THE PLU !! misticalitk's review (This content has been automatically translated from French)" I love it"
Phil C.'s review (This content has been automatically translated from French)" Fully satisfied"
- The respectable number of inputs and outputs. I use it only in home studio. It can connect to a computer via USB or Firewire 2, with which the use of the supplied power is not helpful. Without connecting to a computer (PC or Apple), it can also serve as a mixer on stage for example, there are effects, compressor / limiter and reverb, EQ is very effective. For now, I use the USB port for recording guitar, bass, and occasionally voice, and of course reading moultes sound banks. The drivers are stable the regular updates. I record up to two tracks simultaneously, and read I go to a little less than a twenty. The latency is about 4 milliseconds, very acceptable. I use it with Cubase. This is my first map so sophisticated, so the grip took me a little time. I've had two / three years, I do not know well, and I am fully satisfied. It suited my needs, I upgraderai if I have the opportunity to work on projects much larger than I made today. Leaves today to buy something similar, I will look good on the news, but this interface will keep my reference. Unless you fall on the five-legged sheep, quality converter even better and even lower prices with the same level of reliability, I might repeat this interface. roska's review (This content has been automatically translated from French)" A road"
The drivers are EXTREMELY stable and the machine works perfectly with Logic, Cubase and Cakewalk sequencers are the three most commonly used with Ableton Live. I use it for 3 months without the slightest problem. The quality is very good. Converters are very good quality and the rendering is fairly neutral. The sound is powerful and output effects are of good quality. The housing is very strong and really suitable for mobile use. Anonymous 's review (This content has been automatically translated from French)" Remarkable"
Remarkable device. I chose this sound card, I'm sure this will surprise argument, not mainly for music, but for professional dictation. The recreational use to be quite exceptional. This sound card installed very quickly, is already used on a MacBook Pro with OS Lion Mountain and dictation speech Dictate Mac 3. Works perfectly with Mac OS X Lion Mountain. Remarkable device. I chose this sound card, I'm sure this will surprise argument, not mainly for music, but for professional dictation. The recreational use to be quite exceptional. After long hesitation, I based on very positive reviews on this brand, but also on the size of the interface, to accompany a laptop MacBook pro on the go. The price was also critical, although I made the choice of a high quality sound card, over time, choice, cost-effective and more economical. Besides the obvious quality workmanship, and we note the point is not incidental that this sound card is manufactured in the United States ... This sound card installed very quickly, is already used on a MacBook Pro equipped Mountain Lion operating system and Mac Speech Dictate Dictation 3. This is my first MOTU card and I think it will not last at all ... For now it remains for me to find a firewire adapter, having had to connect for immediate use in USB mode. This text was dictated by the sound card. From the first use, very few mistakes. For me it is a remarkable product. Sound card and my best by far. Far ahead of my TASCAM, ESI, M AUDIO and many others no doubt. High-end sound card, sure, I'm already interested in MOTU DP. PianoLover's review (This content has been automatically translated from French)" 10/10 Windows 7/8 or 64-bit Mac: I love"
AUDIO resolution which will be communicated to the Windows mixer. I check WaveRT. Then I start the course and CueMix FX, I very intuitive makes me moe monitor for output I decline a bit as great audio output level. Rolls that requires a good Windows 7 or 8 for AUDIO (and WASAPI WaveRT) or a Mac. Anonymous 's review (This content has been automatically translated from French)" Bambe the sound card nomad!" I use a MacBookPro with 4GB DDR3 Intel Core 2 Duo 2.93, connected with Firewire and a speaker system Prodipe Pro8 + subwoofer plugged into Jack Pro10S 6.35 on both hand outs that offers the card, for the home studio: Sounds Electro / D & B / Techno / House + recording bass and slap it! It also has a USB 2.0 connection (hence the "hybrid"). I still consider him to stick a tube preamp input to warm my story taken from his. On Mac, audio drivers are generally stable, no problems here either. The software allows you to view Cuemix the rate of exploitation of internal DSP and provides basic monitoring functions + + EQ graphic input graphics compression if needed (with low pass filters and high pass). Latency is impeccable, this card has 8 analog inputs, two XLR / Jack with a real possibility of amplifying the input gain so that even an old keyboard to its very low will emerge with a normal potato, and much outputs. Track headphone can also be routed and used as independent output. SPDIF side: in and out in the CAR and side noon: in and out, standard 5-pin DIN. Installing the fingers in the nose, the MOTU site provides all the necessary tools for download. Reminder: the serial number is located under the beast and do not turn the speakers before you hear a click after starting characteristic of the card. This is the only "galley" I know him. The manual is clear and detailed, in French. The general configuration depends Cuemix, which one is faster, far from the headache caused by the RME interface and its clones miles faders. A knob is dedicated to the headphones volume or the master output, switchable by pressure, allowing direct access, that the MMR did not, and that's good practice to not annoy the neighbors! I last fortnight, it replaces an RME Fireface 800 emergency sold to a member who needed it for a recording ... and me to pay my debts. I had a prior M-Audio Audiophile and an Edirol FA-66, but it was clearly below the range. This card is portable, self: a mini mixer is integrated and visualized. Convertos quality is renowned, it is not hype, it really sounds good and faithful. I, who feared falling on his entry-level, it is not. No cracking, noise or breath, or inadvertent stall: it is perfectly stable, contrary to what was said by PCistes lowest. And I use it daily. The location of exits and entries is knobs wise, everything is easily accessible. You can add a twin sister, the elements of racking are provided and the config is facilitated, explained in the manual. We now have 16 inputs and 16 outputs in Rack 19 "format for the price of a Fireface 800 with occas'! If I find another like new for € 300, I will not hesitate! I put 10/10 (there's no reason, too cool!) Hoping not to have to get this notice for the guidance. mrpessoa's review (This content has been automatically translated from French)" Very good product"
I wanted to move to the higher category, but without spending the big bucks required for RME example. I use this card with a PC properly inflated (12 gb ram, for example), the sound goes on Focal, I play either the Roland or the south (especially Komplete). I work half of the live (Factory / Ableton) half composting arrangements (Cubase). The drivers are a stunning stability. My M-Audio had regular problems, even if it does not crashed as often as the same of my poor brother. No problem on my software does not limit the number of tracks / effects / etc. Latency (in buffer 256) is between 5 and 15 ms.
Easy installation, configuration pretty easy (I read some passages from the manual to clarify some points). No incompatibilities encountered, usually detected immediately on software, or plant in Cubase, the settings are very fine and very practical in Ableton, it's a little rough but it's still effective. I use it for a year. Before I had the M-Audio FW 410.
taking a mic in front, behind a mic jack, blah ... Attention to the default output volume: it may explode your speakers ... Only one headphone jack, bin it? Value for money: frankly, unbeatable, I do it again without hesitation that choice with my budget (for richer, I probably would have chosen an EMR). Morphe777's review (This content has been automatically translated from French)" Excellent"
size, 1 / 2 U, mounted in a rack with a motu micro lite, ca not take place. I love the hybrid. Not too sure of myself when buying on the interface to use, it keeps me from my crash. Now I'm sure the firewire is really good, and I never put it in USB. Its pre-amp microphone is really not bad. I compare it to my first strip sonus channel studio, and I must say that it is more correct. Obviously well below the studio but for a channel pre-amp built-in booster is great. The microphone input in front, super convenient, it saves me to go behind the desk or leave a trailing cables. His capacity as a DAC. I am audiophile with a purse tight, and therefore can not afford to pay me two different systems. Coupled with great headphones, a marvel. Its super stable MAC drivers (never tested on Windows). Turn mixer and PC-free operation. Good functionality mixer is cool, but walk the menu is pretty hassle, so I never use it (I'm lazy by nature). Mas the fact that it lights turned on without the PC is cool qd is to play the zik. Well I'm running out of reasons, but I 'love and do not regret my purchase. for his little meter on the LCD screen, handy for control (RPID finely and not to the size of the screen) which input is used, which output is used. 9 because nothing is perfect, especially in the area characteristics. Driver MAC super stable. Never had a fart. I use it with Logic Pro 9, Audacity, JackAudio. it is always recognized, all entries are still there. No complaints, if not perfect. Even if I turn on the sound card after the PC is turned on, it is recognized directly, without flinching, and this past year and a half. The update of drivers is not very common. On the other hand, are stable, so is it an update is needed. I record the tracks one by one, because I'm all alone to play. Ben, I put 10, never had a problem, everything has always worked no matter what I tried to do. Installation? Double click, and then next, next, following a reboot, and everything works perfectly. The configuration and the tool cue mix is ​​not very easy to use. To manage the mix and other effects must be knowledgeable on the subject, but for basic functions, it is very simple. Yes the manual is very well done and French. 8 due to cue-mix that is not super clear. I use it for over a year and a half. I had an Alesis Firewire 8. Frankly it is day and night. Also good in terms of quality of sound, stable drivers, audio interface, quality buttons, and especially with the quality of pre-amp: the difference is monstrous. After I have not tested other sound card. quality pre-amp and stable drivers. AND HER !!!!! The menus are easily accessible and the buttons are a little too close for big fingers like mine. It is even a qd detail. I got it in time for 350 euros. At that price was a steal, and a value for money génialissime. I do not know how new it is now (at the time € 490) and even at that price, it think it is an excellent value for money. If I do it again the same choice: more ways than one. 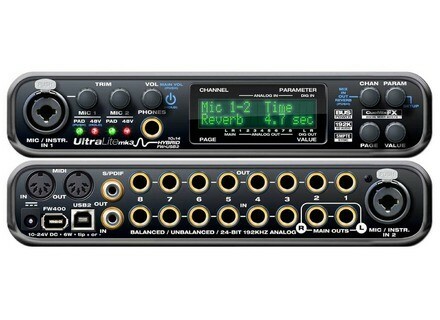 This ultra-compact interface is truly a marvel. She does everything well, and for a price that is reasonable given the benefits. Electric Guitars: Directly on inputs 1 or 2, with or without upstream effects, reverb in the loop: it sounds! After three weeks of intensive use, I have seen no stability problem. I record in General 2 stereo instruments at once. The sound is really amazing: it's consistent, loyal, dull, well-posed, with great dynamic, and numerous tools to refine its decision and the final mix, including the effects of Garage Band (delivered with the computer) that are available in iautomatiquement AudioDesk mixing. FireWire Snow Leopard on iMac with 4GB of RAM: it turns instantly, no crash. and how to have a good monitoring with AudioDesk. But after some tinkering with a good English dictionary will not leave anything to chance, and understood for example that "ANALOG1-2" can be either inputs or outputs, and they have nothing to do with each other - problem is vocabulary-velvet. Metallic box, well made, lightweight and compact, which does not look like a plastic toy. And of course options (effects) which become more limited if we use the high definition (192/24) as it monopolizes the capabilities of the integrated processor. But 48/24 for example, everything is available with a more than adequate for the home studio quality.